Choosing the right sight glass is critical to ensure the material can withstand your application's thermal conditions and corrosive effects. 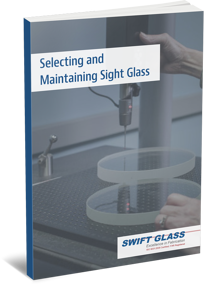 Swift Glass offers a variety of sight glass materials, each of which has unique chemical and mechanical properties. Our guide, Selecting and Maintaining Sight Glass, compares these properties and lists helpful information for maintaining and mounting sight glass. Simply fill out the form at the right to download this free educational guide today.